When I was growing up there were a few special games that I loved playing with my family. We didn’t bring them out every day, but on those special occasions, I so enjoyed the company of my parents and brother as we all played together. We talked, laughed, and had some much-needed family time over a board game. As my own kids grow I want to introduce them to some of the games I played as a kid. 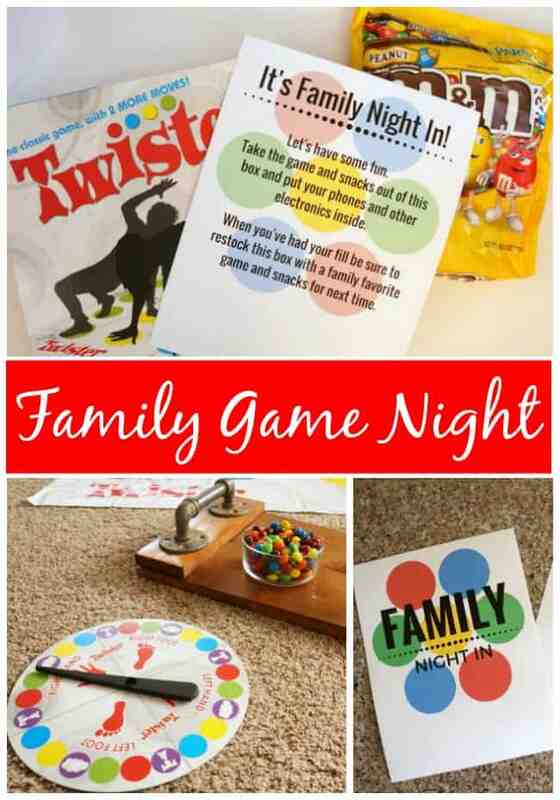 If you are nostalgic about board games as much as I am, you will love this Family Night In game box that makes game night a little sweeter. I’ve incorporated one of my favorite games, a few sweets, and printables for you to put this box together at home. There are rare times when I find myself at home with my family with nothing to do. It’s kind of glorious. No activities, no running errands, no pressure to do anything. It’s times like these that we can all get a little stir crazy. As much as I would love to lounge around and watch movies on a day or night like this, my kids typically want to do something and I take advantage of their eagerness to play with Mom and Dad. I put together a Family Night In game box for times like this. Times when we are all home with no real plans. Times when we need something fun, exciting and special to do as a family. 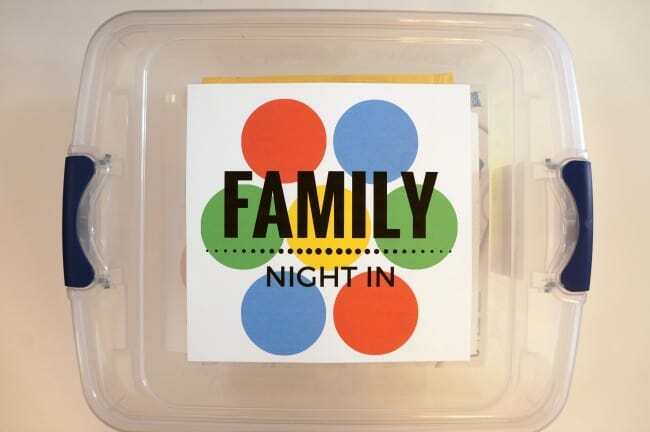 I filled this box with a few very simple items that are guaranteed to make Family Night In a success. 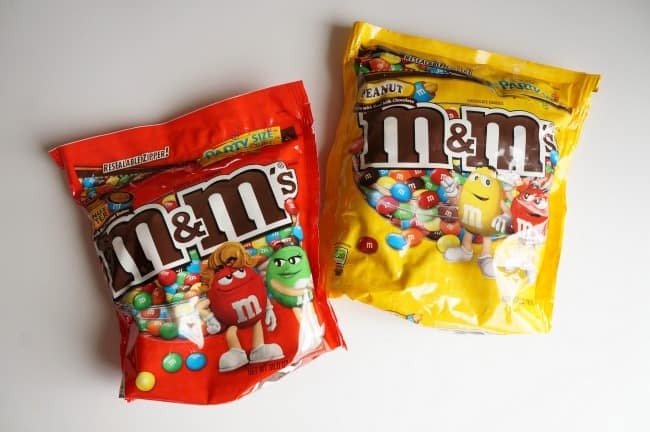 I picked up all of my supplies in one trip to Walmart including 2 of my favorite M&M’s® varieties; M&M’s® Peanut Butter and M&M’s® Peanut. I also purchased a brand new Twister game. I remember our game as a kid being very well loved, so it was exciting to buy a shiny new one. 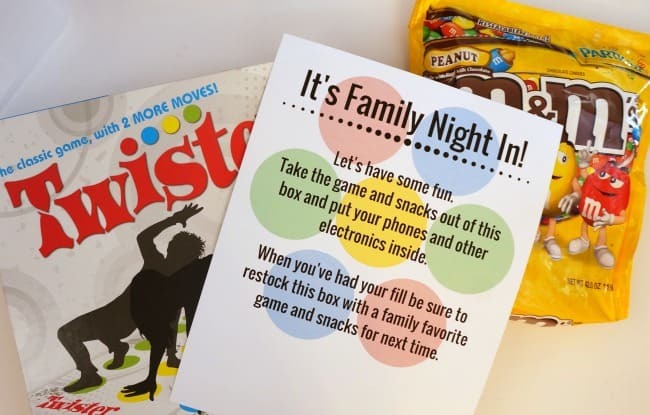 That’s my simple recipe for family fun, and these printables really make this box. Download these printables here. 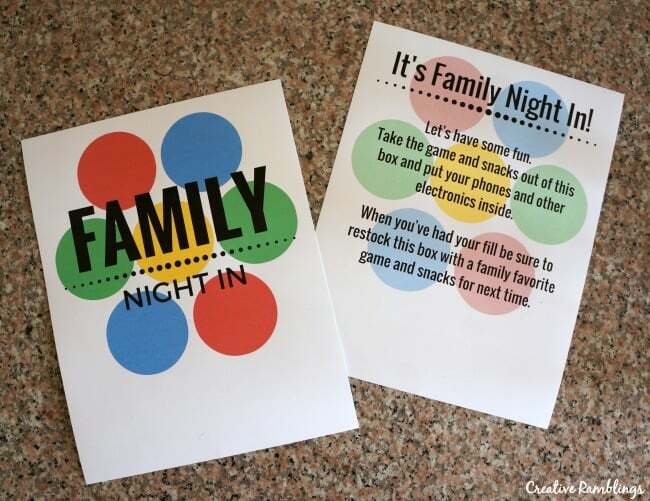 Print them off and attach the bold Family Night In print to the top of the box. Then fill the box with the Hasbro® game of your choice. I chose Twister game this time around because my family cannot play this without giggling. It’s guaranteed to put everyone in a good mood. 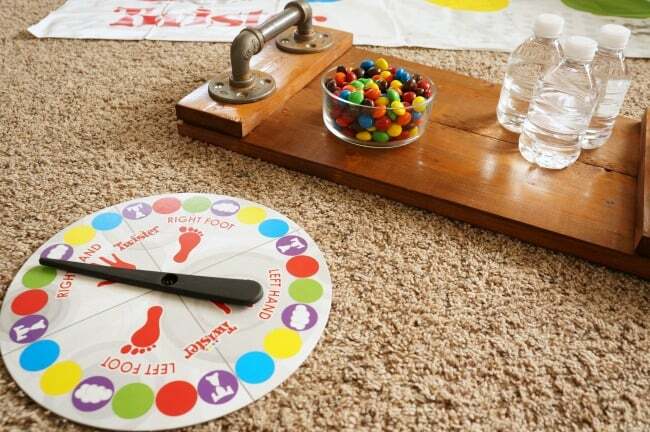 I also added M&M’s® to make game night a little sweeter. 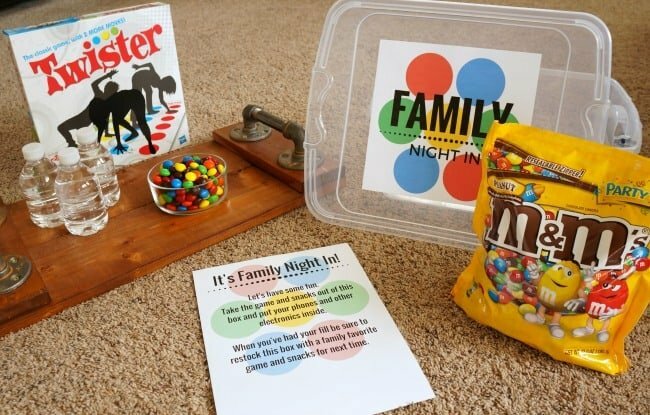 The final touch for this box is a letter with simple instructions for game night. The idea behind this letter is to turn off distractions and really be in the moment with your family. I am guilty of jumping whenever my phone beeps, even if I’m in the middle of something with my kids. If I turn it off or put it out of earshot I am much more attentive and able to be in the moment with my family. Once Family Night In is over, be sure to restock the box. 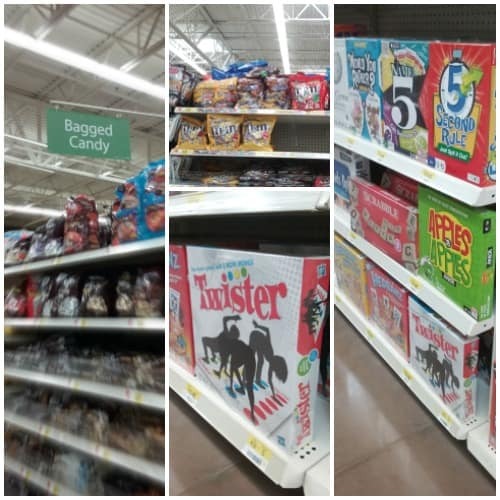 Add a different Hasbro® game and M&M’s® product so your box is ready for the next Family Night In. Relish in these game night memories, your kids will more than likely look back fondly on them one day as will you. Are you ready for Family Night In? 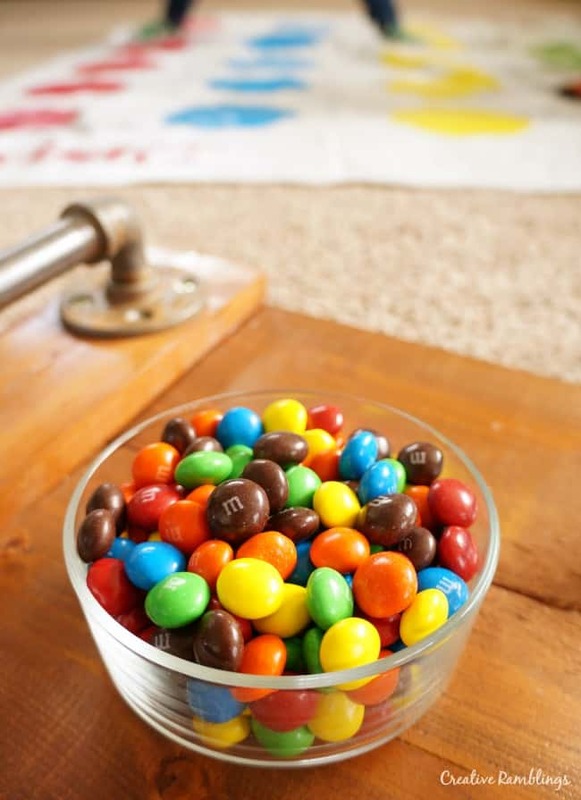 Tell me, what game and M&M’s® product will you put in your box?